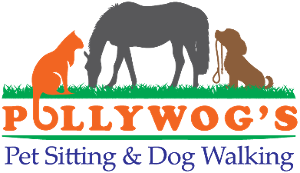 Pollywog's Pet Sitting accepts all major credit cards, cash or checks made out to Pollywog's Pet Sitting. First time clients must make full payment upon starting the first service and have a signed policy agreement on file. Once you become an established client with a good payment record, services can be invoiced bi-weekly or monthly after service completion. All invoices are subject to a $10 late fee for every 10 days they are overdue. A $20 returned check fee plus any bank fees will be incurred by the client. At the initial meet and greet consultation we require you to provide us with a house key or other source of entry. Most clients find that it is convenient to have Pollywog's Pet Sitting keep the keys between service requests. Keys are never marked with obvious identifying information and are stored in a locked safe in a secure location when not in use. We also can use garage codes or other modes of entry that can be discussed during the initial meet and greet consultation. Alternatively we can also provide a lockbox for use. We have found that a lockbox is another safe solution for entry for the pet sitting service. If keys are not obtained at the initial meet and greet consultation, we charge a $10 fee for pickup and delivery of keys. A 10-day notice is required for Holiday cancellations; otherwise, the full cost of service is due. Holidays are our busiest times! We have a cancellation policy in place to ensure that we are available for other clients. Our services continue rain, snow or shine and our schedules are planned carefully to accommodate clients. If a cancellation is made within 24 hours or less of the service, the client is charged the full cost of the service, as this prevents us from seeing other clients. It is our mission to provide you with professional, dependable, and loyal service, in addition to providing your pets with one-on-one love and affection. If ever you are not 100% satisfied with our services, please give us a call. You'll speak directly with the owner to ensure that we figure out the best way to solve any issues. We administer most pills, insulin injections, and liquid medications. All medications must be in the original container with the original label and not be expired. All pets must be familiar with taking the medication. We will discuss all medication needs during the initial meet and greet consultation. For the safety of your home and your four-legged loved ones, we request that there are no other people permitted to care for your pets during our service period. This is due, in part, to insurance reasons.